The Krewe of Highland, a parading Mardi Gras krewe formed in Shreveport, LA in 1994, has been named a “Top 20 Event” by the Atlanta, GA-based Southeast Tourism Society. The 2019 Krewe of Highland Parade will be held on Sunday, March 3. The Krewe of Highland Parade is a popular Mardi Gras event held annually in Shreveport, Louisiana. The Krewe of Highland is gearing up for a busy Carnival season. The Krewe of Highland, a parading Mardi Gras krewe formed in Shreveport, LA in 1994, has been named a “Top 20 Event” by the Atlanta, GA-based Southeast Tourism Society. The Krewe of Highland is gearing up for a busy Carnival season, which will include the annual Krewe of Highland Grand Bal, Friday, March 1 at Shreveport Municipal Auditorium, as well as the enormous Krewe of Highland Parade XXIV, Sunday, March 3 in Shreveport’s Highland neighborhood. For complete information on upcoming Mardi Gras events in Shreveport-Bossier, visit http://www.ShreveportMardiGras.com. Events considered for the STS Top 20 recognition must be at least three years old and have attendance of at least 1,000. Shreveport-Bossier’s Krewe of Centaur Parade was also named a 2018 winner of the STS Top 20 Events Award. The Krewe of Gemini Parade was named a winner of the STS Top 20 Events Award in 2017. The Krewe of Highland’s 2019 theme is “The Greatest Show on Earth.” Tickets to the Krewe of Highland Grand Bal XXIV are $50 for krewe members and $65 for non-members. Tickets to the bal will be placed on sale soon at http://www.kreweofhighland.org. The Krewe of Highland Parade XXIV will begin at the corner of Gregg Avenue and Gilbert Drive in Shreveport’s historic Highland neighborhood at 1 p.m. on Sunday, March 3. The parade will follow a circular route through Highland via Gladstone Boulevard, Creswell Avenue, Hernsdon Street, Highland Avenue, Olive Street, and Centenary Boulevard. Shreveport Mayor Adrian Perkins will serve as Grand Marshal of this year’s parade. 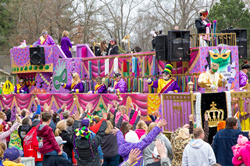 For more information on Mardi Gras parades, parties and events in Shreveport-Bossier, visit http://www.ShreveportMardiGras.com and download a copy of the 2019 Gris Gris Guide to Mardi Gras in Shreveport-Bossier. This annual publication of the Shreveport-Bossier Convention and Tourist Bureau gathers all of the parade dates, routes, road closures, and parade day tips into one handy, pocket-sized guide. A free copy of the Gris Gris Guide may be requested by mail by calling (800) 551-8682. For more information on planning a visit to Shreveport-Bossier, including local restaurants, attractions and hotels, visit http://www.Shreveport-Bossier.org.